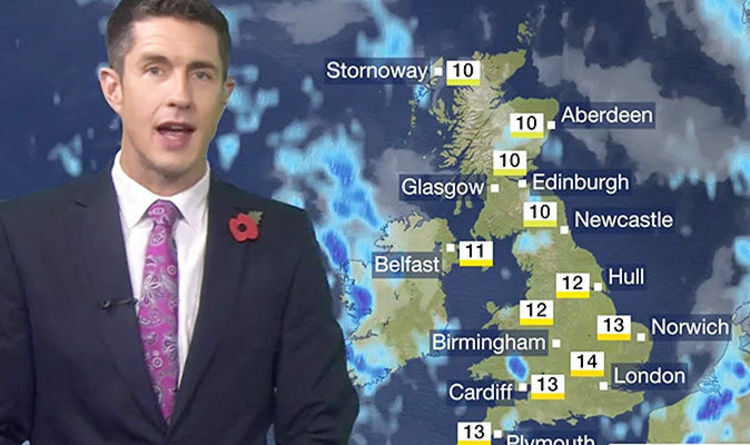 BBC Weather forecaster Chris Fawkes claimed the country will finally enjoy some sunshine on Remembrance Day after days of stormy conditions causing travel disruption and flooding across the UK. The BBC meteorologist warned Sunday will start with some heavy showers for some but the band of rain will be blown away by brisk southerly winds by the early afternoon hours of the day. These winds will also bring temperatures up to very mild levels for this time of the year, with highs of 10C to 14C for most. Mr Fawkes said: “As we go through this evening and overnight expect some further downpours to become quite widespread across Scotland. “More rain across southern counties of England, that’s going to be heavy and could be at times thundery. “Quite gusty winds in the south, temperatures stay mild, 10C overnight in London, a little bit cooler further north with 5C in Aberdeen, Glasgow and for Belfast as well. “On Remembrance Sunday the charts look quite similar to today’s. Low pressure to the west of the UK. “Still brisk southwesterly winds and further showers expected. “Those southwesterly winds will mean that most of the showers will be across western and southern parts of the country. “But they will be blown along by fairly brisk winds which means any showers should last too long in any one place. “They will be blown across the skies followed by some sunshine. The good news comes after a total of 11 flood warnings and 47 flood alerts were issued by the Met Office across the UK on Friday. Fire crews were forced to tackle the catastrophic water levels in Angle and Crundale in Haverfordwest. A total of 10 properties in Haven's Head and Lower Priory, Milford Haven, had to be evacuated. Other parts of southern and central Wales were also at risk of devastation.